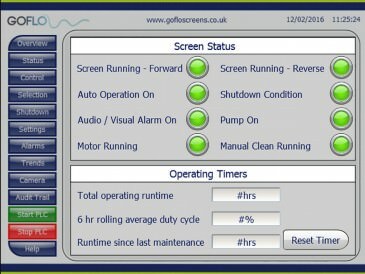 The GoFlo travelling water screen system have multiple methods of operation and comes with a flexible and robust control system. The IP65 rated control panel is installed locally or at some distance from the intake. It is used for enabling automatic or manual control of the screen operation, adjustment of the parameters that define the automatic operation and for alarms that may indicate a problem that requires addressing. 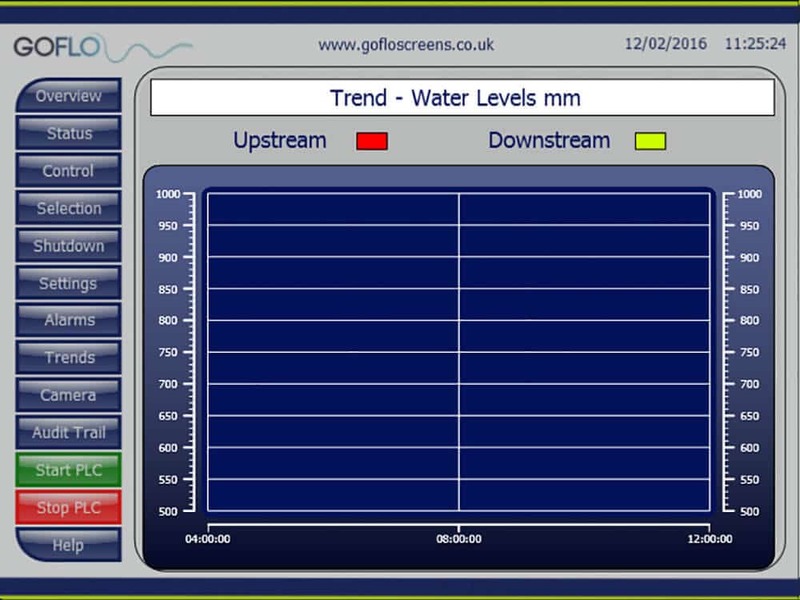 When the system operates in automatic mode the sensors on the travelling water screen determine the differential head and the control panel operates if the differential head exceed the threshold programmed into the system. 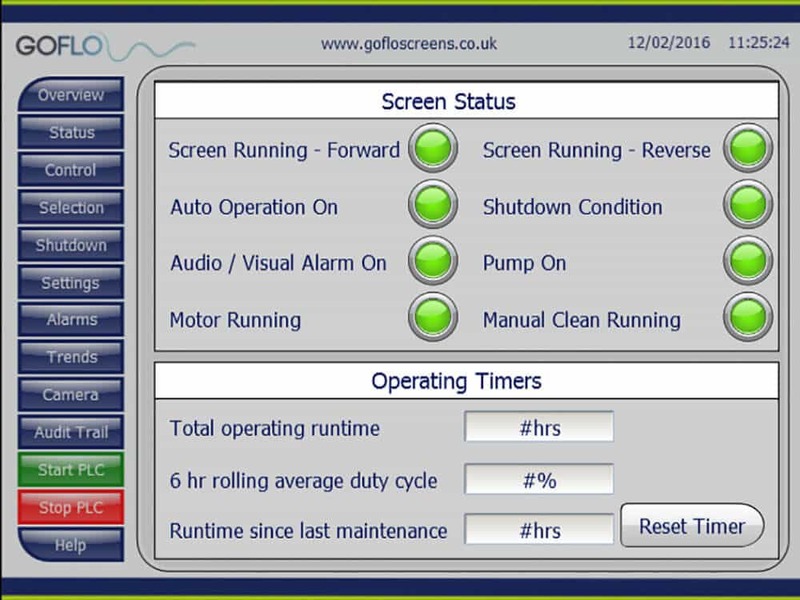 All the parameters showing in the image below are used to control the operational cycle of the screen and can be easily programmed into the local control system interface so that your system can be fine tuned to your operational needs. If you have the automatic flushing option installed then any debris will be flushed out of the collection trough into the downstream disposal point. A warning light and alarm sounds at the screen prior to an automatic cycle starting for your safety. Critical operational alarm settings are also easily programmed into the control system interface, with local control panel and email alerts created should the set points be breached. The system is switched between manual and automatic mode via an input on the control panel screen. The system can be operated in two ways when in manual mode. 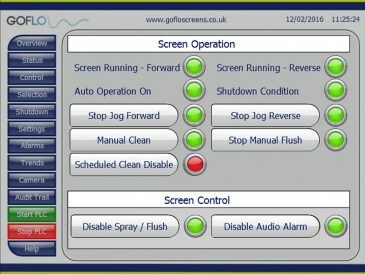 The control panel screen has 3 buttons – Jog Forward, Jog Reverse and Manual Clean. The Jog Forward/Reverse buttons rotate the screen in forward or reverse direction while the buttons are pressed enabling you to manually remove a blockage in forward or reverse direction. the manual clean cycle initiates a full belt rotation with spray/flush operating. The system can be operated on a scheduled basis, irrespective of automatic or manual operation, for a period and interval defined by the operator. 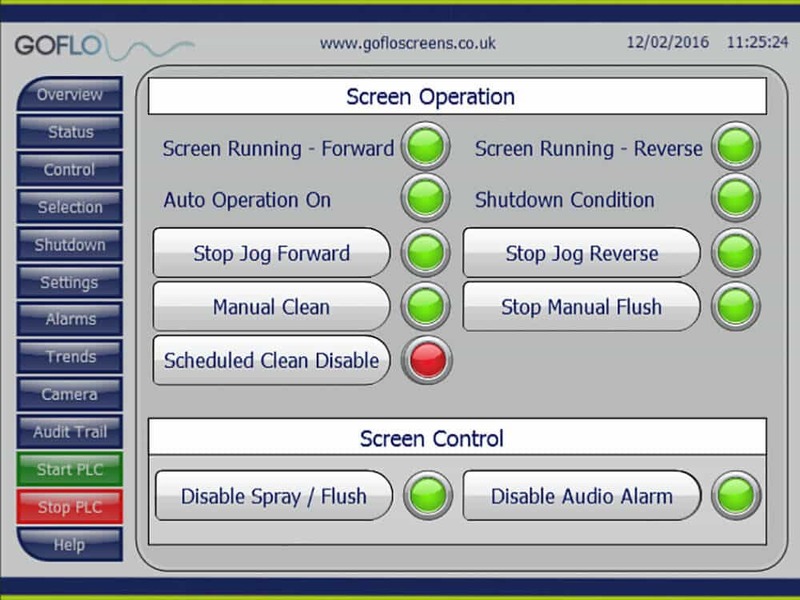 There are a number of screens presented on the control panel that give complete flexibility for the operator to control, monitor and analyse the system. All of the functionality available at the control panel is also available remotely via commonly available mobile devices such as smart phones, laptops or tablets provided an internet connection is available. 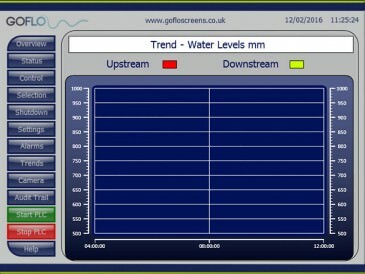 Some of the available screens are shown below.